This website, commeleschinois.ca, is hardly a source of dissident writings. 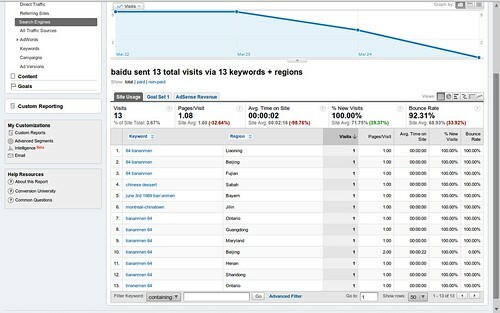 But last month, I had 10 searches for “Tiananmen 64” (6/4 is how the Chinese call that event) coming from Baidu.com. It’s not counting hits from other variants of these search terms, which make another 10 single visits. The article drawing these hits is an account of the 20th anniversary memorial in Montreal that I wrote last June. The event was quite pitiful in terms of attendance, with Amnesty sharing our Chinatown place with the FLG folks, and also an artist guy named LiuYi Wang. 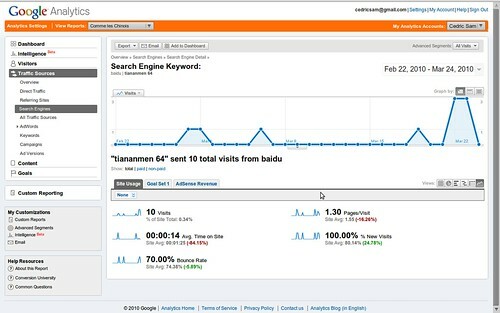 The “bulk” of those hits are from Mainland China (they use zh-cn), and from Mainland Chinese using Baidu. But I don’t know what it means.